This week in committee session City Council voted to move forward with Plan C from the proposed water rate restructuring plan presented by the Water Division. The full council will likely vote in the next couple of weeks to approve and move forward with the rate increases as of January 1, 2016. The media is mostly portraying this as a 12% rate increase in 2016, which is true, but is only one piece of the story. The images above are the slides from the full presentation given on August 26, 2015, by the Water Division. Slide 14 shows the increases that will occur over the next 5 years, resulting in an increase of just under 30% from 2015 to 2020. A quick reminder that the goal of this increase is to help return Water Division reserve funds to $3M, by providing an additional $1M in revenue each year over the 5 years. The reserve funds are intended to allow more pipe to be replaced each year and also to cover unexpected water main breaks. I'm not going to revisit all the reasons why this is not likely to actually occur, this already is my 3rd post about water mains, so feel free to check out earlier musings. But I do have a couple of new items for your perusal. Second: A few weeks ago I did a little more research and put together a spreadsheet comparing the population of Rockford to the miles of water main, from 1860 to the present. Please note -- the population data fell right on the decade, while the water main data fell in between the decades (2005, 1995, 1985, etc. ), so the timing of the data isn't as precisely aligned as the spreadsheet portrays. But the trends are obvious enough, even with that discrepancy. Since 1970, Rockford's population has increased about 1.2%. The size of our water system has increased 112%. We've gone from 14.5 feet of water main per person to 30.45 feet of water main per person. And of course pipes aren't the only component of the infrastructure system, pipes go along with roads, sidewalks, power lines, sewer, curbs, etc. So each person's share of the bill to maintain all this stuff has increased exponentially over time. 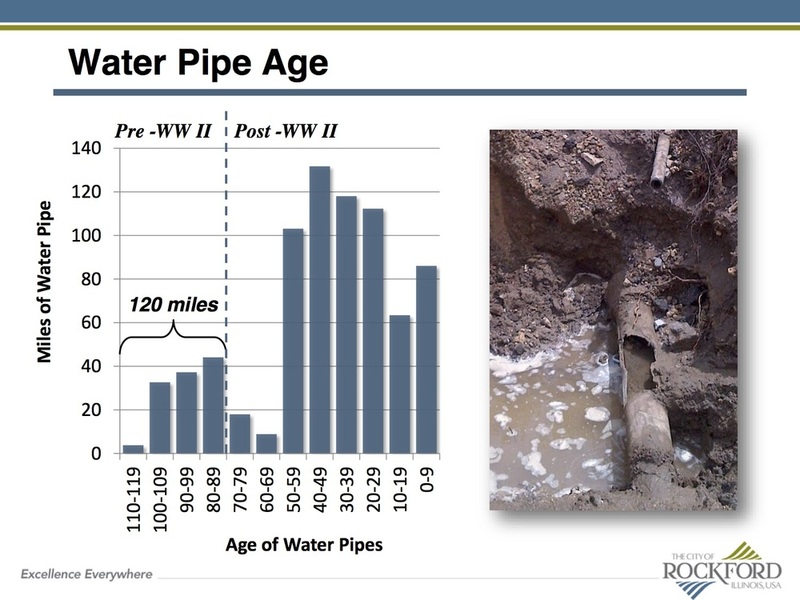 Let me remind you that the current proposed water rate increase is only intended to help address pipes that were laid before 1950; it's almost too painful to even think about what type of rate increase would be needed to address those pipes post-1960. If I'm able to get my name on the public comment docket, I'll be making remarks at City Council this coming Monday. I will voice my support of the rate increase but also my opinion that it's a wholly incomplete solution, another band aid on a system that has been irreparably broken for decades. The capital structure must change, the development pattern must change, the hard decisions must start to be made today, not put off until whole neighborhoods need to be evacuated to other areas of the city where services are still intact. (I'm not being dramatic. See EPA study of Saginaw, Michigan's "Green Zone", with 72% property vacancy, where the city is proposing decommissioning infrastructure.) There's a lot more I want to say, but three minutes is pretty short. Do you have any suggestions about what I should or shouldn't say? Feel free to comment below. I in no way think my comments will have any impact, but heck, I'd love for someone to know that citizens are actually reading the CIP and studying the reports, and that we're watching and listening to see if our leaders are willing to truly take on the big issues or just keep kicking that can. I'll post my comments here next week.